Gorilla Windows is working hard to help save all gorillas in the wild. Today, only about 700 Mountain Gorillas and 200 Cross River Gorillas remain in the African wild. Gorillas have no natural enemies or predators, yet these peaceful creatures are very endangered because of humans. People hunt gorillas for food called bushmeat. Logging companies destroy gorilla habitats. Africa may seem far away, but there is something you can do to help! 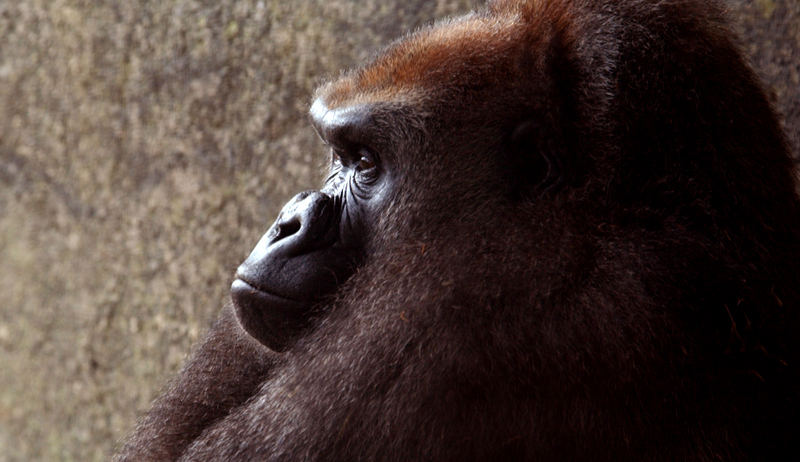 For every Gorilla product you buy, Gorilla Windows will donate money to the North Carolina Zoo in honor of your name. You will receive a certificate of authenticity from the North Carolina Zoological Society’s Conservation Fund verifying the donation towards the gorillas. If you have any questions, please feel free to contact Mr. Russ H. Williams, Executive Director of the Zoo at (336) 879-7252. Time is running out – so, please help to save the gorillas. Many people like to compare gorillas with humans, but there are several differences. Although they are able to stand upright, gorillas prefer to walk using their hands as well as their legs. Their arms are much longer than their legs, and they can use the backs of their fingers like extra feet when they walk. This is called the knuckle walk. A group of gorillas living together is called a “troop.” There can be 5 to 30 gorillas in one troop, led by a strong, experienced male known as a "silverback." His job is a big one. He is responsible for the safety and well being of the members of his troop. The silverback makes all the decisions, such as where the troop will travel for food each day, when they will stop to eat or rest, and where they will spend the night. Can you imagine waking up each morning surrounded by food? Almost everything a gorilla eats is plant material, so life in the forest is like living in a huge restaurant! 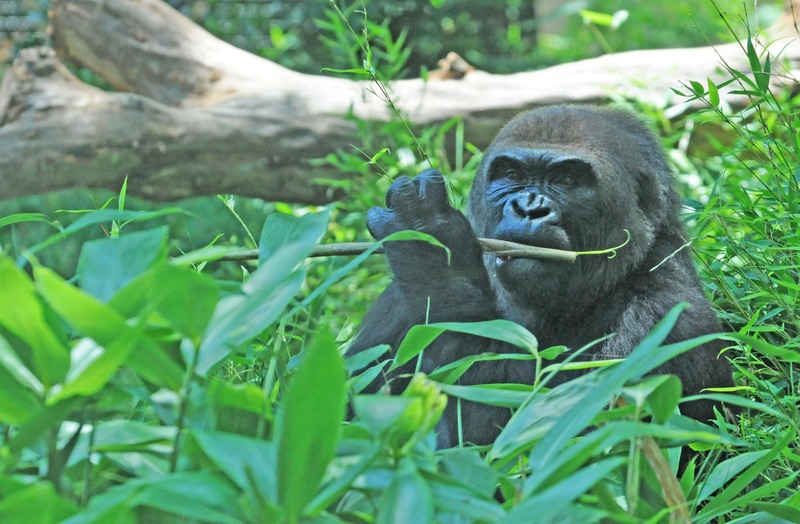 Gorilla food includes leaves, stems, fruits, seeds, and roots. And gorillas love to eat—it’s their favorite activity! An adult male will eat up to 40 pounds (18 kilograms) of food each day. Gorillas’ large stomachs can hold the bulky food they eat. Strong jaws help them chew tough stems. A gorilla troop doesn’t stay in the same place for more than a day. After all, they don’t want to deplete their food source! Each morning the silverback will lead his troop to a new area where food is plentiful. After a morning of munching, each adult gorilla gathers leaves, twigs, and branches to make a day nest for resting while the youngsters play. After their nap, the gorillas will eat again until bedtime, when they make yet another nest, either on the ground or in a tree, for a good night’s sleep. Gorillas never use the same nest twice. A female gorilla is ready to have babies of her own when she is about eight years old. But first, she must leave the safety of her own troop and find another troop or a lone silverback to live with. A newborn grows quickly. At five to six months old it learns to walk, and by 18 months of age it can follow mom on foot for short distances. Still, the safest place for the youngster is its mother's back as she travels thru the dense vegetation of their forest home. Young gorillas learn by imitating what the others in the troop are doing, and by play fighting with other youngsters. Even the stern silverbacks are gentle with the little ones as they practice new skills. A young gorilla stays close to its mom, sharing her nest, until it is four to six years old.